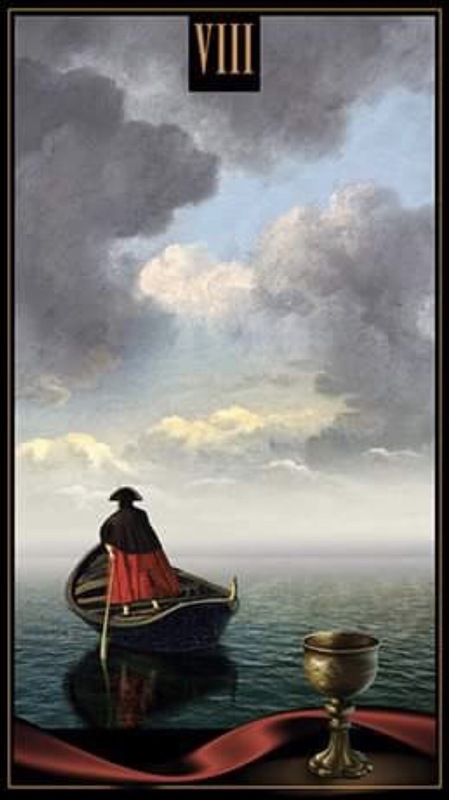 A man in a boat is looking into the distance. He has made for the open sea, beyond the lagoon, to take a new untraveled road. What is calling him to the unknown? What is he leaving behind? MEANING: voluntary leaving, self-denial, renunciation of habitual things, vagrancy, travelling, parting, acquisition of something new. This entry was posted in Artist, Deck Review, Featured Card of the Day, General Tarot, Readings and tagged 8 of Cups, Eugene Vinitski, Tarot, Venetian.